It is hard to believe that Bambi , the story of a cute fawn in the classic Disney movie, celebrates its 75th anniversary this year. It is fun to follow adventures of Bambi in the forest from the moment he learns how to walk to days he becomes a grown-up deer prince ready to protect his family. New Blu-ray version of the movie brings more colors and effects to reflect the forest life and delights of the nature. Bambi learns a lot in the forest, he finds new friends there Thumper and Flower. He is a little baby who is curious about everything around and face the challenges with an open heart. Is is a thunder storm or lightning, snow, ice or fire, Bambi is here to experience everything the forest prepared for him. He has to learn and grow with it. Kids love watching Bambi movie, they compare him to a little baby growing up and exploring everything around. There are lots of funny moments along with quite sad ones. The movie continues to inspire with great animation features even nowadays we like it as many years ago. The artists who worked on this movie did an enormous job creating amazing characters and reflecting the wonders of woods. Bambi joins the Walt Disney Signature Collection and now available on Digital HD, Blu-ray™, DVD and On-Demand. 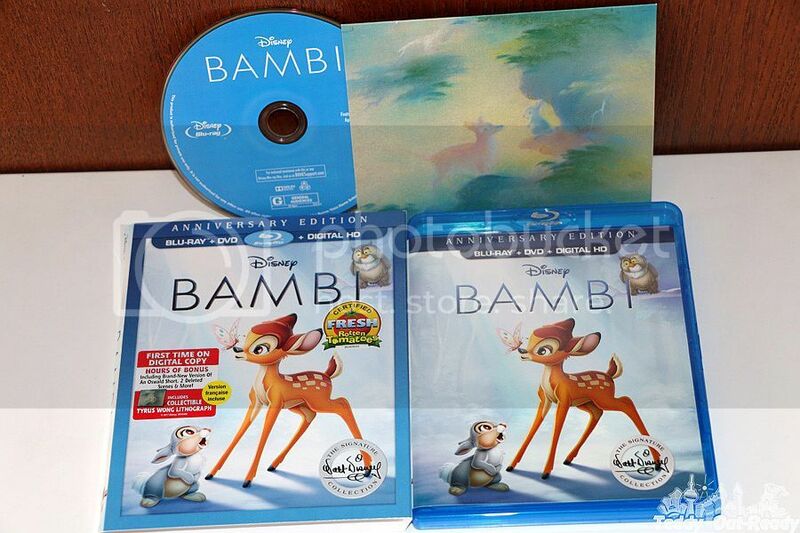 The Collection release includes a variety of new bonus material, including recordings of Walt Disney discussing the challenges and triumphs during the production of “Bambi;” deleted scenes and characters; stories and effects that Bambi had on the Studio, other films and artists; and much, much more. Additionally, the Digital HD release includes an exclusive, heartfelt feature on the incredible artist, Tyrus Wong, who inspired the film’s soft watercolor backgrounds and beautiful palette. For our Canadian readers, we are excited to give them the chance to win a copy of Bambi the Walt Disney Signature Collection for themselves thanks to Walt Disney Studios Canada. The giveaway ends June 23, 2017. For your chance simply fill the form below and Good Luck! I would love to win this for myself to add to my collection, and then my grandchildren can watch it when they come over!! I would like to win this for myself and watch it with my niece! I would love to win Bambi for my little niece. i would like to win Bambi Combo for my granddaughter. I would love to win it for my niece and nephew. I'd just love to win this to watch it with my grandson and granddaughter! would love to win so that when the step grandkids visit we can watch together! I would like to win the Bambi Combo for my niece. I would love to win for my little girl! I would like to win Bambi Combo for my children, and I'd love to watch it with them. I would love to win Bambi for my granddaughter so she will love it as much as I do. My four kids would all enjoy watching this with me. I would like to win the Bambi Combo for my grandson. We were telling him the story a couple of weeks ago and now he'd like to see the movie. I would love to win this for my little sister!